This project aims at allowing Objective Caml to take advantage of multicore architectures, notably those now commonly used in laptops and desktop PC. early 2010 : (ocaml-3.11.1) adaptation to work on x84-32 and x84-64, with Linux and Mac OS X. Fairly unstable. It started in 2008 as an OCaml Summer Project 2008 funded by Jane Street Capital. It has continued since then. Warning : For testing purpose only. It should not be used for production. Some additional versions may appear in the download directory. If you choose to test/use them, you should be sure to know what you do. 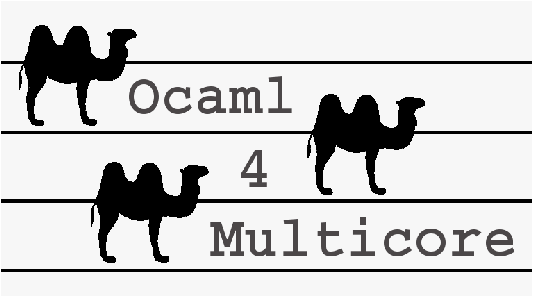 OCaml4MultiCore is a free software under the CeCILL-B license.